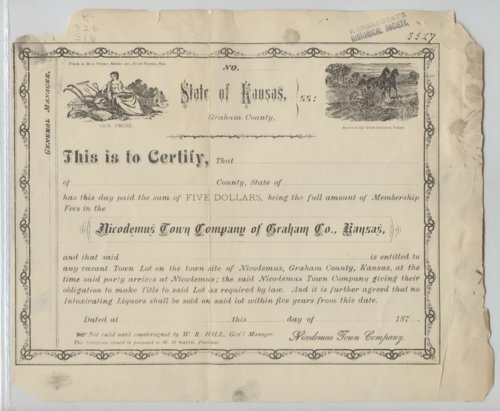 This certificate for the Nicodemus Town Company was used to acknowledge membership which, along with a five dollar fee, was required of every emigrant seeking to settle in Nicodemus. The certificate is blank. Nicodemus, in Graham County, was an Exoduster settlement founded in 1877. A driving force behind the creation of the colony was William R. Hill, whose name appears on the bottom of the certificate. This source can be used in tandem with other documents related to Nicodemus, including articles from the Nicodemus Western Cyclone, images of Nicodemus (both from the 19th and 20th centuries), and advertisements for immigration.